Victor Luitpold Berger (February 28, 1860 – August 7, 1929) was a founding member of the Social Democratic Party of America and its successor, the Socialist Party of America. Born in Austria-Hungary, Berger immigrated to the United States as a young man and became an important and influential socialist journalist in Wisconsin. He helped establish the so-called Sewer Socialist movement. Also a politician, in 1910, he was elected as the first Socialist to the U.S. House of Representatives, representing a district in Milwaukee, Wisconsin. In 1919, Berger was convicted of violating the Espionage Act for publicizing his anti-interventionist views and as a result was denied the seat to which he had been twice elected in the House of Representatives. The verdict was eventually overturned by the Supreme Court in 1921, and Berger was elected to three successive terms in the 1920s. Berger was born into a Jewish family on February 28, 1860, in Nieder-Rehbach, Austria-Hungary (today in Romania)[dubious – discuss]. He was the son of Julia and Ignatz Berger. He attended the Gymnasium at Leutschau (today in Slovakia), and the major universities of Budapest and Vienna. In 1878 he immigrated to the United States with his parents, settling near Bridgeport, Connecticut. Berger's wife, Meta Schlichting, later claimed that Berger had left Austria-Hungary to avoid conscription into the military. In 1881 Berger settled in Milwaukee, Wisconsin, home to a large population of German Americans and a very active labor movement. Berger joined the Socialist Labor Party (then headed by Daniel de Leon), and became the editor of two newspapers: the Vorwärts and Die Wahrheit. Berger taught German in the public school system. His future father-in-law was the school commissioner. Berger later married Meta Schlichting, who was an active socialist organizer in Milwaukee. For many years, Meta Berger was a member of the University of Wisconsin Board of Regents. Books and pamphlets and letters from socialists came by every mail and I began to read and think and dissect the anatomy of the system in which workingmen, however organized, could be shattered and battered and splintered on a single stroke [...] It was at this time, when the first glimmerings of socialism were beginning to penetrate, that Victor L. Berger — and I have loved him ever since — came to Woodstock [prison], as if a providential instrument, and delivered the first impassioned message of socialism I had ever heard — the very first to set the wires humming in my system. As a souvenir of that visit there is in my library a volume of Capital by Karl Marx, inscribed with the compliments of Victor L. Berger, which I cherish as a token of priceless value. In 1896, Berger was a delegate to the People's Party Convention in St. Louis. In 1897, he married a former student, Meta Schlichting. The couple raised two daughters, Doris (who later went on to write television shows such as General Hospital with her husband Frank) and Elsa, speaking only German in the home. The parents were strongly oriented to European culture. He was sublimely egotistical, but somehow his egotism did not smack of conceit and was not offensive. It was the expression of deep and naive faith in himself, and this unshakable faith was one of the mainsprings of his power over men. 1900 members of the National Executive Committee of the SDP. Berger was a founding member of the Social Democracy of America in 1897 and led the split of the "political action" faction of that organization to form the Social Democratic Party of America (SDP) in 1898. He was a member of the governing National Executive Committee of the SDP for its entire duration. Berger was a founder of the Socialist Party of America in 1901 and played a critical role in the negotiations with an east coast dissident faction of the Socialist Labor Party in the establishment of this new political party. Berger was regarded as one of the party's leading revisionist Marxists, an advocate of the trade union-oriented and incremental politics of Eduard Bernstein. He advocated the use of electoral politics to implement reforms and thus gradually build a collectivist society. Berger was a man of the written word and back room negotiation, not a notable public speaker. He retained a heavy German accent and had a voice which did not project well. As a rule he did not accept outdoor speaking engagements and was a poor campaigner, preferring one-on-one relationships to mass oratory. Berger was, however, a newspaper editorialist par excellence. Throughout his life he published and edited a number of different papers, including the German language Vorwärts ("Forward") (1892–1911), the Social-Democratic Herald (1901–1913), and the Milwaukee Leader (1911–1929). 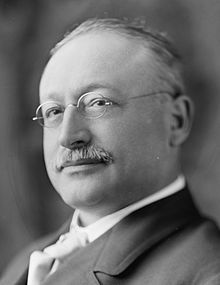 Berger ran for Congress and lost in 1904 before winning Wisconsin's 5th congressional district seat in 1910 as the first Socialist to serve in the United States Congress. In Congress, he focused on issues related to the District of Columbia and also more radical proposals, including eliminating the President's veto, abolishing the Senate, and the social takeover of major industries. Berger gained national publicity for his old-age pension bill, the first of its kind introduced into Congress. Less than two weeks after the Titanic passenger ship disaster, Berger introduced a bill in Congress providing for the nationalization of the radio-wireless systems. A practical socialist, Berger argued that the wireless chaos which was one of the features of the Titanic disaster has demonstrated the need for a government-owned wireless system. Although he did not win re-election in 1912, 1914 or 1916, he remained active in Wisconsin and Socialist Party politics. Comrades, I have gone through a number of splits in this party. It was not always a fight against anarchism in the past. In the past we often had to fight utopianism and fanaticism. Now it is anarchism again that is eating away at the vitals of our party. If there is to be a parting of the ways, if there is to be a split — and it seems that you will have it, and must have it — then, I am ready to split right here. I am ready to go back to Milwaukee and appeal to the Socialists all over the country to cut this cancer out of our organization. The regulars won the day handily at the Indianapolis convention of 1912, with a successful recall of IWW leader "Big Bill" Haywood from the SP's National Executive Committee and an exodus of disaffected left wingers following shortly thereafter. The remaining radicals in the party remembered bitterly Berger's role in this affair and the ill feelings continued to fester until erupting anew at the end of the decade. Victor Berger, in Literary Digest, 1920. Berger's views on World War I were complicated by the Socialist view and the difficulties surrounding his German heritage. However, he did support his party's stance against the war. When the United States entered the war and passed the Espionage Act in 1917, Berger's continued opposition made him a target. He and four other Socialists were indicted under the Espionage Act in February 1918; the trial followed on December 9 of that year, and on February 20, 1919, Berger was convicted and sentenced to 20 years in federal prison. During the 1918 Wisconsin special senate election, Berger ran for the seat under federal indictment. His newspaper, the Milwaukee Leader, had printed a number of anti-war articles which lead to the postal service revoking the paper's second-class mail privileges. Despite the circumstances, Berger won 26% of the vote statewide in an April special Senate election to fill a vacancy, winning 11 counties in a three-way race. The espionage trial was presided over by Judge Kenesaw Mountain Landis, who later became the first commissioner of Major League Baseball. His conviction was appealed, and ultimately overturned by the Supreme Court on January 31, 1921, which found that Judge Landis had improperly presided over the case after the filing of an affidavit of prejudice. In spite of his being under indictment at the time, the voters of Milwaukee elected Berger to the House of Representatives in 1918. When he arrived in Washington to claim his seat, Congress formed a special committee to determine whether a convicted felon and war opponent should be seated as a member of Congress. On November 10, 1919, they concluded that he should not, and declared the seat vacant. He was disqualified pursuant to Section 3 of the Fourteenth Amendment to the United States Constitution. Wisconsin promptly held a special election to fill the vacant seat, and on December 19, 1919, elected Berger a second time. On January 10, 1920, the House again refused to seat him, and the seat remained vacant until 1921, when Republican William H. Stafford claimed the seat after defeating Berger in the 1920 general election. Berger defeated Stafford in 1922 and was reelected in 1924 and 1926. In those terms, he dealt with Constitutional changes, a proposed old-age pension, unemployment insurance, and public housing. He also supported the diplomatic recognition of the Soviet Union and the revision of the Treaty of Versailles. After his defeat by Stafford in 1928, he returned to Milwaukee and resumed his career as a newspaper editor. On July 16, 1929, while crossing the street outside his newspaper office, Berger was struck by a streetcar travelling on North Third Street (now Dr. Martin Luther King Drive) at the intersection with West Clarke Street in Milwaukee. The accident fractured his skull, and he died of his injuries on August 7, 1929. Prior to burial at Forest Home Cemetery his body lay in state at City Hall and was viewed by 75,000 residents of the city. Berger's papers are housed at the Wisconsin Historical Society, with smaller numbers of items dispersed to other locations. The complete run of the Milwaukee Leader exists on microfilm published by the Wisconsin Historical Society and on site at the University of Wisconsin in Madison. [Y]et as long as capitalism lasts, speculation is absolutely necessary and unavoidable in order to protect the system from stagnation." So this is another evil that is inherent in this system. It cannot be avoided any more than malaria in a swampy country. And the speculators are the mosquitos. We should have to drain the swamp-change the capitalist system-if we want to get rid of those mosquitos. Teddy Roosevelt, by starting a little fire here and there to drive them out, is simply disturbing them. He is causing them to swarm, which makes it so much more intolerable for us poor, innocent inhabitants of this big capitalist swamp. ^ "The Espionage Act and the "Golden Key" to Stop the State". Center for a Stateless Society. ^ a b "Victor L. Berger | Encyclopedia of Milwaukee". emke.uwm.edu. Retrieved 2018-02-05. ^ See: Rafael Medoff, Jewish Americans and Political Participation: A Reference Handbook, Santa Barbara, CA: ABC-CLIO, 2002, p. 330. ^ Mark Avrum Ehrlich, Encyclopedia of the Jewish Diaspora: Origins, Experiences, and Culture, Volume 1, Santa Barbara, CA: ABC-CLIO, 2009, p. 593. ^ a b Bekker, Jon (2008). "Berger, Victor". In Vaughn, Steven L. (ed.). Encyclopedia of American Journalism. CRC Press. p. 49. ^ Dodge, Andrew R. (2005). "Berger, Victor Luitpold". Biographical directory of the United States Congress, 1774 - 2005. Government Printing Office. p. 647. ISBN 978-0-16-073176-1. ^ Sally M. Miller, "Victor Louis Berger," Historical Dictionary of the Progressive Era, 1890-1920. Westport, CT: Greenwood Press, 1988, p. 38. ^ Sally M. Miller, Victor Berger and the Promise of Constructive Socialism, 1910-1920. Westport, CT: Greenwood Press, 1973, p. 17. ^ Thomas, William H. (2008). Unsafe for democracy: World War I and the U.S. Justice Department's covert campaign to suppress dissent. University of Wisconsin Press. p. 113. ISBN 978-0-299-22890-3. ^ Constantine, J. Robert, ed. (1990). Letters of Eugene V. Debs, Volume 1. University of Illinois Press. p. 102. ISBN 978-0-252-01742-1. ^ Eugene V. Debs, "How I Became a Socialist." The Comrade, v. 1, no. 7 (April 1902), pp. 147-148. ^ Sally M. Miller, Victor L. Berger and the Promise of Constructive Socialism, 1910-1920. Westport, CT: Greenwood Press, 1973; p. 22. ^ Morris Hillquit, Loose Leaves from a Busy Life. New York: Macmillan, 1934; p. 53. ^ Miller, "Victor Berger," p. 38. In her short thumbnail sketch, Miller notes that Berger "opposed orthodox Marxists, who, in turn, called [Berger] an opportunist". This actually refers to the revolutionary socialist left wing rather than the "orthodox Marxist" followers of Karl Kautsky, which was the majority tendency in the Socialist Party of this era. ^ Miller, Victor L. Berger and the Promise of Constructive Socialism, 1910-1920, pp. 23-24. ^ Amendment to Article 2, Section 6, proposed by William Lincoln Garver of Missouri. John Spargo (ed. ), National Convention of the Socialist Party Held at Indianapolis, Ind., May 12 to 18, 1912: Stenographic Report. Chicago: The Socialist Party, , p. 122. Hereafter: 1912 National Convention Stenographic Report. ^ Speech of Victor Berger 1912 National Convention Stenographic Report, p. 130. ^ "Victor Berger Campaign Banner," United States Senate campaign banner for Milwaukee Socialist Congressman Victor L. Berger, April 1918 (Museum object #1992.168) and Historical Essay, from the Wisconsin Historical Society. ^ Berger et al. v. United States, 255 U.S. 22, 41 S.Ct. 230,(1921). ^ "In regard to the first question, your committee concurs with the opinion of the special committee appointed under House resolution No. 6, that Victor L. Berger, the contestee, because of his disloyalty, is not entitled to the seat to which he was elected, but that in accordance with the unbroken precedents of the House, he should be excluded from membership; and further, that having previously taken an oath as a Member of Congress to support the Constitution of the United States, and having subsequently given aid and comfort to the enemies of the United States during the World War, he is absolutely ineligible to membership in the House of Representatives under section 3 of the fourteenth amendment to the Constitution of the United States." ^ Elmer Beck, The Sewer Socialists: Vol. I, The Socialists Trinity of the Party, the Unions and the Press. Fennimore, WI: Westburg Associates Publishers, 1982; p. 133. ^ The Milwaukee Leader, University of Wisconsin-Madison Libraries, MadCat. ^ Daniel Yergin (1991). The Prize: The Epic Quest for Oil, Money, and Power. New York: Simon & Schuster. p. 910. ISBN 0-671-50248-4. Beck, Elmer A. The Sewer Socialists: A History of the Socialist Party of Wisconsin, 1897-1940. (2 vols.) Fennimore, WI: Westburg, 1982. Benoit, Edward A. A Democracy of Its Own: Milwaukee's Socialisms, Difference and Pragmatism. Thesis. University of Wisconsin-Milwaukee, 2009. Kipnis, Ira. The American Socialist Movement, 1897-1912. New York: Columbia University Press, 1952. Muzik, Edward J. Victor L. Berger: A Biography. Ph.D. dissertation, Northwestern University, 1960. Muzik, Edward J. "Victor L. Berger: Congress and the Red Scare". Wisconsin Magazine of History, vol. 47, no. 4 (Summer 1964). Nash, Roderick. "Victor L. Berger: Making Marx Respectable". Wisconsin Magazine of History, vol. 47, no. 4 (Summer 1964). Quint, Howard H. The Forging of American Socialism: Origins of the Modern Movement. Columbia: University of South Carolina Press, 1953. Stevens, Michael E. & Ellen D. Goldlust-Gingrich,(eds.). The Family Letters of Victor and Meta Berger, 1894-1929. Madison: Wisconsin Historical Society, 2009. Wachman, Marvin. History of the Social Democratic Party of Milwaukee, 1897-1910. Urbana: University of Illinois Press, 1945. Wikimedia Commons has media related to Victor L. Berger. United States Congress. "Berger, Victor Luitpold (id: B000407)". Biographical Directory of the United States Congress. "Burgher Berger. ", Time Magazine, Aug. 19, 1929. Dreier, Peter. "Why Has Milwaukee Forgotten Victor Berger?" Glende, Philip M. "Victor Berger's Dangerous Ideas"
Harrison, Emily. "The Case of Victor L. Berger: Drawing the Line Between Dissent and Disloyalty"
Spargo, John. "Hon. Victor L. Berger: The First Socialist Member of Congress," The American Magazine, 1911. "Berger, Victor L." . Collier's New Encyclopedia. 1921. This page was last edited on 19 April 2019, at 14:58 (UTC).